My son, Stephen Haar, 41, was murdered in Albuquerque on January 15, 1998. He was the third of my children to die a violent death. APD spokesman Tony Herrera released a statement to the media that Stephen was found dead in the street at Erbbe and Constitution, shot in the chest or back, with a shotgun lying beside him, giving the impression that he was killed during a street fight. That was an out and out lie. Stephen wasn't killed in any street fight, he was found dead inside a residence at 1325 Erbbe NE, the home of a man who is reportedly a confidential informant for APD. Stephen had been estranged from our family for years because of his drug use, but in the month before he was killed he tried to make amends. He'd come over to the house and tell his brother to be glad of his normal lifestyle, because he didn't have to distrust everyone and be afraid all the time. During that month Stephen told me twice, "Mom, they're going to kill me." I said, "Stephen, who is going to kill you?" He said, "If I told you, you wouldn't believe me. It's best that you don't know." He told the same thing to friends. A man named Travis Dally has admitted to shooting Stephen and was arrested but not charged, because he claims self-defense. How can it be self-defense when Stephen was shot in the back? Our family has strong reason to believe that Travis was hired to kill Stephen. After Stephen's death I found a note in his jeans pocket warning him about a contract and naming the same informant for APD in whose home Stephen was shot. 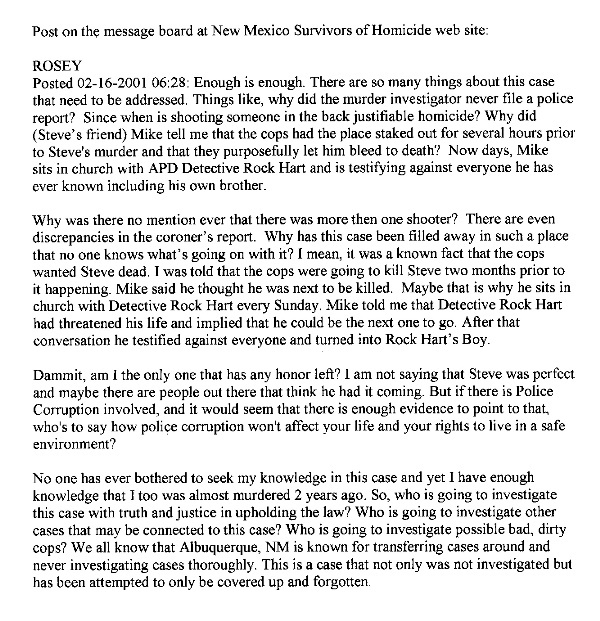 I believe Stephen was killed for the same reason Peter Klunck was -- he knew too much about dirty cops who were involved in the Albuquerque drug scene and was a threat to them because he was trying to get straight. Stephen and Peter knew each other. Both were welders and did body work on cars. Stephen also knew Matt Griffin (the Ninja Bandit), the police officer who killed Peter Klunck. I met with people from the Office of the Medical Examiner and they seemed surprised at the self-defense statements. They said one of the wounds indicated that Stephen was shot by somebody standing over him when he was already down. I took that information to APD homicide detective Damon Fay and asked him, "If Travis shot Stephen once, and if he was down, why did Travis shoot him again?" His response was, "Well, Travis had to get out the door." Stephen was lying there, bleeding to death, and Travis had to get out the door? Stephen was in the way, so it's okay to shoot him twice? That's not self-defense! I've talked to a few people who know what happened, but they will not come forward because they're too scared. They tell me there was more than one shooter and that part of the payment Travis received came from a police officer. They say the cops had the place staked out for several hours prior to Stephen's murder and that they purposefully let him bleed to death. When I asked Det. Fay if Travis was being protected because he was an APD snitch, Fay told me that, while not an official informant, Travis "did favors" for APD. One can't help wondering what sort of favors they were. Our private investigator interviewed Travis at the state penitentiary in Santa Fe where he was serving time for another unrelated shooting. During that interview, Travis freely admitted to killing Stephen and gave our investigator a physical demonstration of how he did it. According to Travis, he and Stephen had been struggling over firearms when Travis's shotgun went off, shooting Stephen in the stomach. Stephen looked up from the floor and told Travis, "Man, I love you" and rolled over onto his stomach, and Travis used a handgun to shoot him in the back. Travis said, "I shot him five times. I had no choice." Police told reporters that, since Travis claimed self-defense, they would not charge him with killing Stephen and instead were forwarding the case to the District Attorney's office. Months went by, and nothing more happened, so in Sept., 2000, I contacted the D.A. 's office to ask why charges hadn't yet been filed against Travis. "Julie" in Case Management, told me that the D.A's office had no file on the Stephen Haar homicide. Detective Fay did not submit a report to the D.A. 's office. Julie said that, based on my information, a file would now be started. In March, 2001, our private investigator rechecked court records. Travis had still not been charged with Stephen's murder. The Haar family has long believed that Stephen was murdered by a hired killer because he "knew too much" about drug activities involving people in influential positions. In June 2004, KRQE TV aired information from a confidential narcotics report about drug activities involving, not only Judge Brennan, but numerous other prominent NM judges, attorneys and members of the state legislature dating back many years. "It draws on a variety of sources and reads like a Who's Who of the New Mexico drug underworld," the reporter said. "Judges, lawyers, politicians, sports celebrities and prominent businessmen appear in the report right along side the State's narcotics kingpins." David Iglesias, US Attorney for New Mexico, called the detailed document about drug smuggling and money laundering in New Mexico "a page-turner I couldn't put down." The Haars and other NM families who believe their loved ones were killed because they "knew too much," (Kaitlyn Arquette, Ramona Duran, Peter Klunck, etc. ), are eager to learn the identities of the VIP drug traders whose names are contained in that report. But they have been told that those names cannot be released, because the VIPs have not been arrested. On July 2, 2009, Travis Dally was sentenced to life in prison for the murder of another victim, Henry George, whom he killed in 2002. Dally killed George after George sought protection from police because of a threat to his life. Stephen's mother testified at the trial in the George case that Dally had also murdered Stephen. Det. Fay testified under oath that he had never met Dally, despite information from the Assistant United States Attorney, Randy Castellanos, that Fay interviewed Dally at a prison facility in Grants, NM, after Stephen's death.